The etón S350 DL offers exceptional value and superior reception of AM, FM and international shortwave. An analog receiver with digital display of frequency and clock, it offers the best of both worlds to the radio enthusiast. Utilizing today's most modern single-conversion superheterodyne circuit design, it's powered by four D cells for exceptionally long play-time and comes with an AC adaptor. It receives continuous shortwave from 2.9 - 27.4 MHz, covering all 13 international shortwave broadcast bands of 11, 13, 16, 19, 22, 25, 31, 41, 49, 60, 75 and 90 meters. You will get news and events from all over the world and superior reception of your favorite domestic AM and FM stations, including those often hard to pull-in AM talk shows. It's ideal for the AM DX'ing enthusiast too. There is a built-in, defeatable, 90 minute sleep timer that automatically turns the radio off after 90 minutes so if you fall asleep the radio will not play all night long and run down the battery. You can now set the clock while the radio is playing. A wide and narrow switch on the front panel allows you to narrow the radio's bandwidth to reduce adjacent channel interference. A new SW/AM frequency lock circuit improves stability to reduce drift. There is a built in telescopic antenna for FM and shortwave plus a built in ferrite bar antenna for AM. The back panel features a 75 ohm KOK antenna jack for FM and spring loaded terminals for 500 ohm AM/SW wire antenna and ground. There is also a 6 VDC [] input jack for the supplied AC adapter. The right side of the S350 even has left and right line level outputs and a stereo/mono switch. Plus there is a stereo earphone jack for private listening. With comfortable carry handle. The 4¾ inch speaker provides big sound. Requires four D cells or four AA cells (not supplied). Comes with AC adapter, Owner's Manual. Click here to view larger image. 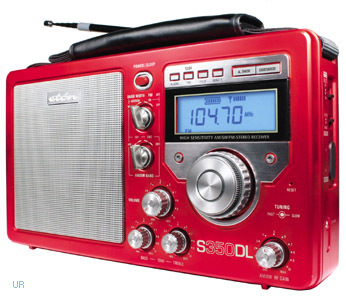 This radio came in a silver, red or black versions. The black GS350DL version carries the Grundig label rather than Eton label. 10.5 x 6.5 x 3.5 inches 3 lbs., 9 oz.